The hallways at McCluer North High School in Florissant didn’t look all that different last August from when Lydia Garrighan roamed them regularly as a student four years earlier. This time, the University of Missouri–St. Louis senior was a teaching candidate, embarking on her yearlong practicum as part of the College of Education’s studio schools program. Still, she couldn’t quite shake the feeling of déjà vu. “I was like, ‘I am back in high school,’” Garrighan said, with a laugh. Some things were different, though. Student and teacher pride seemed higher than when she was a high schooler, thanks in large part to the MN Strong organization started by teachers. SAIL, short for “School Adventure into Learning,” is one of the main projects for studio-school teacher candidates from UMSL, a chance for them to see their ideas take root in a real-life educational setting. Domescik and Garrighan made up one of the 34 groups that presented the outcomes of their SAIL projects to instructors, fellow students and other interested parties May 3 at the ED Collabitat. 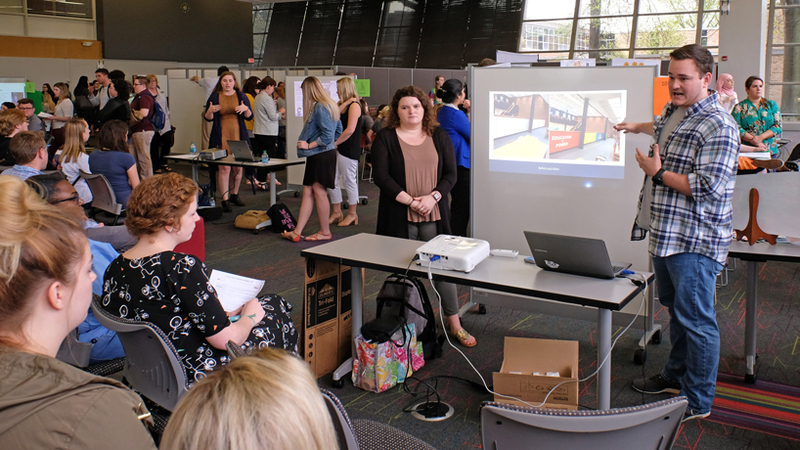 Nearly 70 teacher candidates in total took turns presenting their ventures, which they had implemented at 35 of UMSL’s partner elementary, middle and high schools in the greater St. Louis area. Among the many SAIL projects, there were fundraisers for school improvements. There were multicultural learning activities. There were STEM – science, technology, engineering and mathematics – celebration events. There was a zine-making class for artistic elementary schoolers. The UMSL teacher candidates put their passion into practice. At McCluer North, Domescik, Garrighan and Strasser Champ took a two-pronged approach. 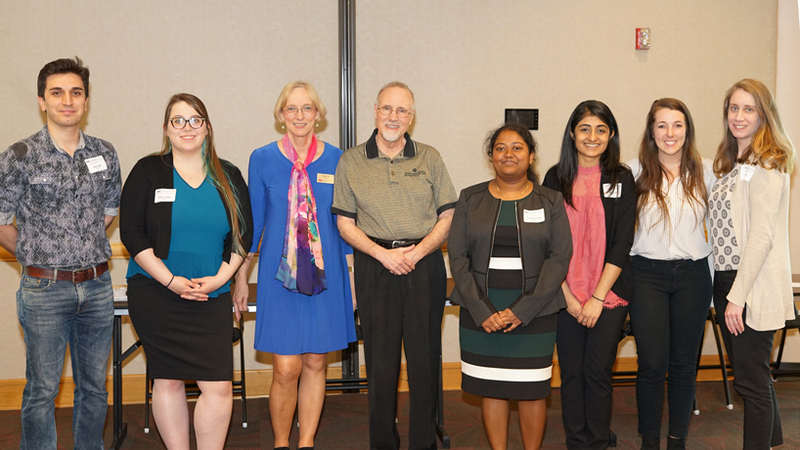 Garrighan organized a roundtable discussion in which she invited six recent alumni back to talk about their lives after graduation with the school’s seniors. The six panelists included college students alongside ones who took a less conventional route, such as dropping out and getting a full-time job, or taking time off to volunteer with AmeriCorps. Domescik led the other part of the project with help from his UMSL cohorts. Similar to UMSL’s “Choose Your Word” campaign last year, the teacher candidates polled more than 300 students on what one word they associated the most with education. They picked the four top vote-getters – growth, opportunity, power and success – and undertook a two-day project to paint the walls outside the school’s advising offices in vibrant colors and messages that read “Education=” and then each of the four words. The project pulled in students and staff from English, biology and social studies, as well and shop and computer classes. Koscielski said she hopes the teacher candidates will carry these ideas through to the master’s program at UMSL or into their professional careers. The university has maintained a good track record of seeing its students hired at the 36 affiliated studio schools since the program started in fall 2012. As part of her SAIL project, Kayla Seablom worked with fourth- and fifth-graders at Flint Hill Elementary School to produce art projects that would go up for silent auction at a fundraiser for expanding, and making handicap-accessible, the playground at the new school in Wentzville. The event raised $8,000. Even though her practicum year is coming to an end, she still talks about Flint Hill as her school. Garrighan said her time at McCluer North did more than give her a chance to impact her alma mater. It clued her in to her potential.